These fun layouts make me want to dress my (now teenagers) up in their favorite childhood memories so I can capture the fun and amazing memories like the ones you'll see below. We're still hunting for more winners of the new Haunted Manor Collection...scroll down to find out how you can enter today. For years now I've been wanting to scrap this photo of my daughters birthday party, but never found the right paper or embellishments .... until now! This Halloween line from Doodlebug is so extensive! All papers are double sided, there are so many designs to choose from and so many embellishments and matching stickers! I'm really happy how this turned out! Btw in this photo my daughter is celebrating her 7th birthday, right now she's busy planning her 16th! Supplies: Patterned Paper: Haunted Manor, Mini Doodle-Pops (Wise Guys), Doodle Twine (Halloween), Cardstock Stickers "Icons" and "Party Banner" (Haunted Manor), Buttons and the 6x6 Paper Pad (Haunted Manor). We'd love it if you would pin your favorite layout from today. Then let us know you did. If you aren't on Pinterest, then share the link to today's post on your Facebook, blog or email. Come back and tell us you did that and you'll be entered to win. Winners will be selected and announced on Monday, August 27th. I pinned Monique's Halloween Party. I pinned Monique's....love those little ghosts peeking from behind the paper! I pinned Monique's page. Her design is just so much fun!!! I pinned those great spiders as a fine example of the DoodleBug Halloween goodness. I love all of them but I pinned 2011 Halloween! Just so cute and simple. It was a tough call but I pinned Kandis' layout!! These are all amazing projects though!! They are all great but I pinned the Halloween Party layout. I pinned Kandis' layout! LOVE it! This is such a cool collection. I just emailed Kandis Smith's adorable layout ...its my fav. thanks. Thank you for a chance to win. I pinned it, facebook about it and blogged about it too. Posted the link on FB! I love this Halloween collection! I pinned Kandis' layout - so cute! I pinned the Halloween Party LO. I pinned Monique's Halloween party. I love those ghosts peeking out at the top!!! Pinned Monique's layout on my scrapbook layout board. Yeah - I pinned the layout 2011 Halloween on my Doodlebug board on Pinterest. Yes - I have a board devoted to Doodlebug on my Pinterest & it's not because I design or work for them but because I LOVE Doodlebug products. They are the best around. Thank you!! I just pinned (mslalamac). Take care. 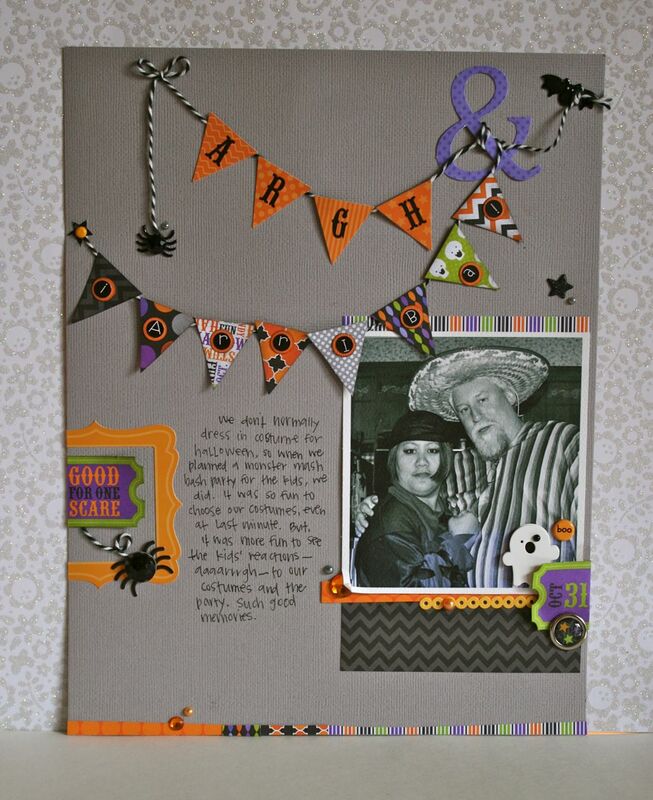 Just pinned Halloween 2011 layout - very cute! I just pinned all three before I scrolled down to see the giveaway!! Love this collection - it's so much fun!! Love the projects! Very cute collection!! I shared the link on Facebook! http://www.clipix.com/Clipdetail.aspx?multiboardId=46251&clipboardid=38509&clipid=717322 This is a link to my "clip" on Clipix instead of Pinterest. I like how you made the ghosts peek thru the torn paper. I pinned Kandis' LO! The spiders are too cute! I pinned the 2011 Halloween layout. Sooo cute! Love this line! I pinned this before I even knew it was a contest! Love these LO's! Phyllis Johnson said Our favorite halloween tradition is to decorate the whole house inside and out for halloween. I love the cards. They are so cute. I love making cards. This cartridge would be great for halloween cards and favors for grandkids.